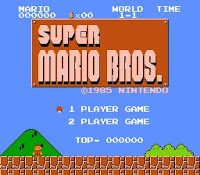 Even though I'd already decided that the level design aspect alone of this Super Mario ROM hack project made it too problematic to be worthwhile (even though it was very simplistic, compared to any other ROM you'd want to hack), I still wanted to finish the thing. That meant trying to do anything else I'd be required to do if I pursued a legit project. In other words, I needed to change some sprites, work out the colors, and get some new text. My first thought was to change out the Bullet Bills I had flying around the level. All the goombas had been replaced with Bullet Bills because it meant Colure wouldn't encounter any enemies, making it (relatively) impossible for her to die. But flying bullets didn't really mesh with the cutsey theme, so they need to go! There's a number of ways to get to the sprites at a center of a ROM-POP. I opted to rip em out and screw around with them in good old MS Paint. This is the part where I started to panic a bit. Sprites don't come out in pretty pictures, which I remembered. Nor do they have the correct "colors", which I also remembered. What I didn't remember was how easily it was to get a headache staring at these things while you played "Where's Waldo? ", or in my case, Bullet Bill. I momentarily gave up and decided to just change the flag logo at the end to a heart. Cute, but serious weaksauce. With renewed vigor, I went back and found Mr. Bill. I had no idea what to do with him. A smiley face seemed likely. I passed this one over to my resident artist and had her think of something while I worried about solving other issues; namely, palette. I didn't want to be limited to Bullet Bill's white-black-red color scheme, but unfortunately, I quickly discovered that it'd be impossible to change. Well, maybe not impossible, but very ill-advised. Early games had limited palettes, and plenty of objects shared the same one. In Bullet Bill's case, he happened to share the same palette as all of the environment backgrounds. Changing him to pink, for example, gave the whole world a serious hue of princess. Not to be deterred, I opted to simply give our leading man a different coat of paint. Saddened that the world would not be bathed in pink, Colure suggested we make Mario dazzle instead. I obliged. She also gave me two concepts to go with. One was too complicated to draw crosswise into four pieces; the other I could do poorly. So we went with that. Finally, the only sort of thing I could think of to change that I hadn't yet was some text. So I fired up the old hex editor, worked up a letter table to help me find words (like I did back in the day when I wanted to prove that Shadow in FF6 didn't have a super-secret 7th dream), and made some minor changes. Fun to see how little text is actually used, and how much it stands out when you reduce everything down to hexadecimal. And that's it. I'm ultimately amused by the project, but there's far better uses of time. I can really only see ROM-Hacking as a hobbyist pursuit by foaming-at-the-mouth fans of particular game, and I mean that in the most obsessive, craziest way. I might be a huge classic gamer, but considering just how cumbersome the process is, I don't think there's a single game I'd ever want to bother with that much. So onto new horizons! We'll see what I end up screwing with next. Now that school prep is temporarily finished while I wait to hear back on applications, I've thrown myself back into learning Python, which has been a blast. And while it's something I do try to do every day, it doesn't hurt to take breaks every now and then and do something else. I've decided to use that time to work on silly projects. I say silly because I don't think they're really going to accomplish anything - they're mostly just a chance for me to educate myself about some area of interest. They'll all be fairly game-related, but I fully expect a lot of them will be mostly useless. I once dabbled with hacking a ROM at a time when we weren't so removed from that generation. I gave up because initial attempts didn't work right, and it seemed like a waste of time. I was still pretty sure it'd be a waste of time, but I wanted to at least see what was involved in such a project, and just how much of a waste of time it would be. I quickly decided on Super Mario Brothers as my game of choice, namely because it'd be easiest. I already knew there were a number of level editors that would make the level design aspect of hacking this particular ROM pretty simple, and the game itself is fairly basic. My intentions weren't really to design an elaborate level - I just wanted to figure out how cumbersome it would. A "hello world" was in order! But since the world has never bothered to say hi to me, I opted to do a little dedication to my wife instead. A little corny I know, but fun. You'll notice the COLURE isn't quite to scale - it's basically spread throughout the entire level, which wasn't my desire. Levels are divided into rooms, which have a set number of objects and enemies. 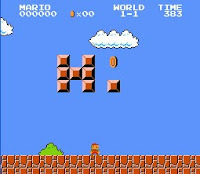 The first room you encounter, for example, has a row of five bricks, 3 question mark boxes (1 with a mushroom), and two enemies. Hacking a ROM image means you're limited to changing what you've got, less than creating per se. I couldn't just stick a ton of blocks in the first few rooms - I was limited to modifying what was there. I'm not saying you couldn't get elaborately creative in working around that sort of structure - plenty of people have, believe me, and when you can change a pipe to a row of 5 or more bricks, that's no small change. But for me it seems like way more trouble than it's worth. That's basically the thesis statement of this project, by the way. So it's Sunday, and if Friday is all about partyingpartyingyeah, Sunday is all about confessing, which probably isn't catchy enough to be the next Rebecca Black hit. But maybe it's just enough for decent blog fodder! 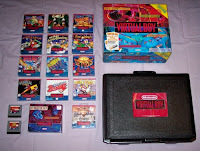 So, Sunday Confessional: I would like to own every Virtual Boy game ever made. I'm a big collector at heart, and one of these days I'll have a solid collection of every legit system ever made, and I'll be content with that. I'm never going to try to get all 767 NES games because I don't really to. 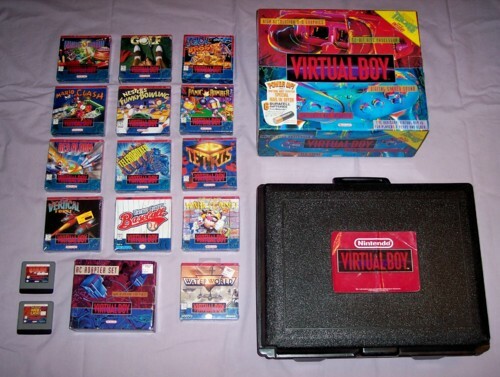 But all 22 Virtual Boy titles? Sign me up. Sue me, I love the thing. It's not just a bad system! It's a colossally bad system! It's an incredible, beautifully awful idea. And I really get a kick out of using it. You'll never encounter another experience quite like it! I don't even know where to throw it on a console checklist - it doesn't fit any categories! Really, what's not to like? Except everything about it? Right? I thought so. I'm at eight. Probably the eight cheapest as well. I'm not saying this is going to happen tomorrow. I'm not even saying it's a lifetime goal. I'm just saying... I think it'd be cool if I had all of them. That's all. Whew. I feel better now. Truly this is what confessionals are all about! Maybe next week I'll be ready to delve into something more serious. Like enjoying Zelda II. Going to try to use this site again as a place to talk about the process of going back to school for round 2, discuss various projects I'm working on in an attempt to better myself (but mostly have fun), and whatever silly things come to mind at any given time. It's mostly for my benefit to keep me on track with things, but you're welcome to come along for the ride. Eventually we'll get a total site design and the like. This is really more like a Day #2 Kitchen Nightmares relaunch than a than Day #3 one. But let's see how it goes. As for the process: am working full-time again, which is good for funding purposes, not so much for using the time to work on learning things. But it's probably for the best in the long run. Also received notice this week that my readmission application to UCF was accepted. So even in the worse case scenario, I am going back to school somewhere. Which means a lot, trust me.